Whew, these last few months have been a blur of work, airports, travel and changes...or at least an attempt to change. I recently returned from a trip to Vegas! 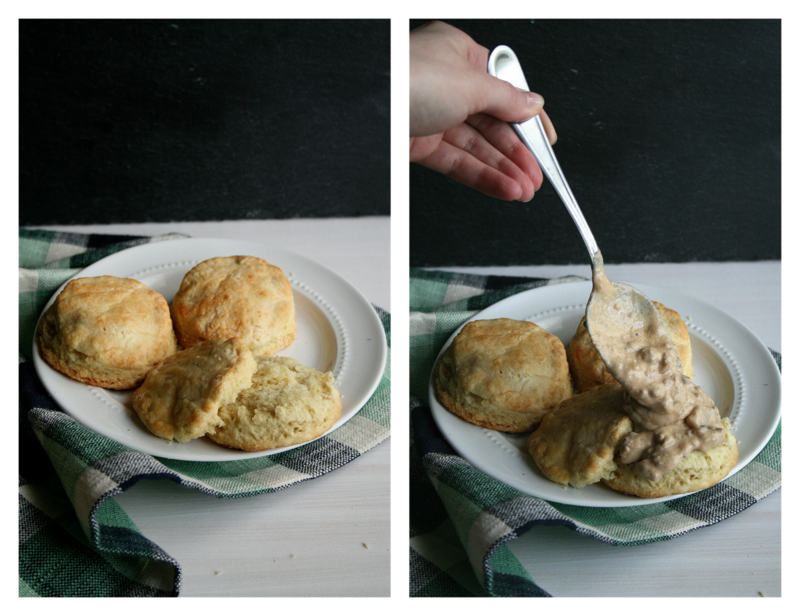 It was a wonderful crazy adventure but I'll save that for another post, this one is all about some killer biscuits and gravy! Being from the south, you'd think I'd be a biscuit making beast by now but I realized I haven't actually made homemade biscuits since culinary school! I think people get intimidated at the thought of getting some dough on their hands but using a food processor makes this process super easy and even fun! As for the gravy, you might be questioning my vegetarian ways but I think this can stand up to standard sausage gravy. I think the addition of mushrooms is vital just because it adds that savory, earthy quality that makes it more "meaty" even if you're not a mushroom fan I think you should still try it - being diced into tiny pieces I promise you, you're not even gonna notice. I tried my best to portray the right amount of measurements, when I am creating something in the kitchen sometimes I get a little carried away and just start adding things without measuring but it's always good to taste as you go and add more spice or saltiness depending on your personal preference. 2.In food processor, pulse flour, sugar, baking powder, salt and baking soda to blend (be careful some flour might escape). Add pieces of butter and pulse until mixture resembles coarse meal. Slowly pour in buttermilk while pulsing until evenly moistened. 4.I like to brush additional buttermilk on top of each biscuit but that's optional. Bake until biscuits are golden brown on top, about 15 minutes. Cool slightly. Serve warm. 1.In a large sauce pan melt 1 TBS of butter, add onion, mushroom, and celery and cook on medium low heat until onions are translucent. Add meatless crumbles and spices (you may need to add 1 or 2 TBS of water if the mix becomes too dry). Cook until "meat" begins to brown. 2.Empty the meat and veggie mixture into a bowl and set aside. Using the same pan, melt 3 TBS of butter then slowly add flour, making a roux. Add milk/cream and whisk until smooth and it begins to thicken. I froze both the leftover gravy and biscuits and they kept nicely for a week wrapped up in the freezer.